How did a new, irresistible brand of television emerge from the Lebanese Civil War (1975–91) to conquer the Arab region in the satellite era? What role did seductive news anchors, cool language teachers, superheroes, and gossip magazines play in negotiating a modern relationship between television and audiences? How did the government lose its television monopoly to sectarian militias? 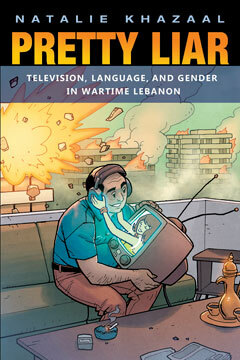 Pretty Liar explores the rise of language and gender politics in Lebanese television during the Civil War of 1975–91. Khazaal tells the untold story of the coevolution of Lebanese television and its audience, and the ways in which the war influenced that transformation. Khazaal analyzes news, entertainment, and educational shows from Télé Liban and LBC, novels, periodicals, and popular culture to explain how controversies over language and gender became a referendum on television’s relevance. Based on empirical data, Khazaal shows how television became a site for politics and political resistance, feminism, and the cradle for postwar Lebanon. Pretty Liar challenges the narrow focus on present-day satellite television and social media, offering the first account of how broadcast television transformed media’s legitimacy in the Arab world. This groundbreaking book shows how the history of television in Lebanon is a history not merely of corporate technology but of a people and their continuing demand for responsive media, especially during times of civil unrest. Natalie Khazaal is Assistant Professor of International Studies and Arab culture at Texas A&M University and a member of IAMCR.